This can also be used to control the access of users in the client-server environment. You can restrict access down to a single screen, or offer a range of screens, all accessible through your customised workbook menu. Workbook Mode is a different mode from Utilities Mode, workbook is both setup and configured from within Utilities Mode. It is set up from a ‘User Preference’ file from Utilities Mode. The Administrator has full control over all users access to the system. Workbook mode may be set up for a user with either options for convenience or when limited access by a user is required to the system. Setting up details for workbook mode is done from Preference Inquiry from Utilities mode. Administrator can select any option from any SapphireOne module for a specific user for their day-to-day activities. SapphireOne Workbook makes it easy for the administrator to control user’s access to any part of the SapphireOne system. Any number of users may be setup to use a single user preference file. 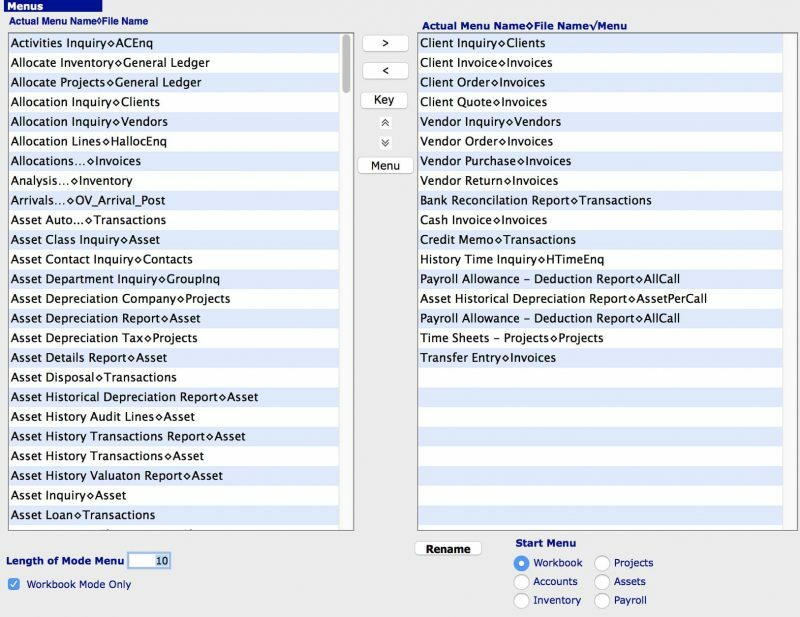 For example, users in the accounts department would be required to have a standard list of items to access. The administrator would then create a single user preference file and link them all to it. This would require the creation of a user preference file once and once only, eliminating the need for individual user preference files to be created for each user. SapphireOne workbook mode enables the administrator to set up a single user or a group of users limited to the functions that they will be required to use for the duties they are assigned. There are two user created drop down menus, workbook and workbook 2 that may be set up for the users that contain only the functions that they need access to. There is also a general drop down menu that has items on it that users require common access to. Any Leave Requests may be made here. Mail Book is used for electronic record keeping of mail physically sent and received from either Australia Post or a courier of some type. However, the function may only be accessed here from the General drop-down menu in Workbook and not from the Palette. The system also keeps a Phone Log from the SpliceCom phone system if installed. Administrators may see all logs while a user is limited to the calls made by themselves. There are two workbook menu in workbook module. The length of the workbook menu can be controlled from the user preference section of Utilities mode. For instance, workbook menu length can be 4, 5, 10, etc. All items on the workbook menus are automatically allowed to be accessed by the users. Any items in other menus that the user does not have access to will either not be displayed or greyed out as seen in the screenshot. The General menu of SapphireOne Workbook module provides common access to general functionality like leave request, data entry, phone log, tracking notes, document management etc. System Administrators have the ability to create workbook menus for a single user or a group of users depending on the selection made of a user preference file. This drop-down menu will hold any overflow from the first workbook menu. Workbook and Workbook 2 drop-down menus are provided so that the menus do to not become excessively long. There are lots of tools available in all modules of SapphireOne ERP Enterprise business Accounting software which are useful for custom management of accounting system and fine tuning.